Izukawa was born in 1981, and he is from Suita City in Osaka. He graduated from the Osaka University of Arts in music technology. He first encountered the shakuhachi when he took a class at the university. Later, he met Satoshi (Zenpo) Shimura, associate professor and a researcher of Jinashi Shakuhachi. Sharing Shimura's thoughts, he decided to pursue the succession of the vanishing Komuso Shakhachi snd Zen. He is a head of the NPO group "Fuke! Hogaku no Kaze (Blow! The Wind of Traditional Japanese Music)," which is run by younger members. He strives to preserve and spread traditional Japanese music with the intention of spreading the greatness of traditional culture to the world. He is a member of the Society of Research in Asiatic Music, Information Processing Society of Japan, Komuso Kenkyuukai, Kyochiku Zenji Housankai, and Electronic Musical Education Society in Japan. He is a lecturer at the Osaka University of Arts and Kobe Yamate College. He is an information engineer at the Osaka University of Arts. 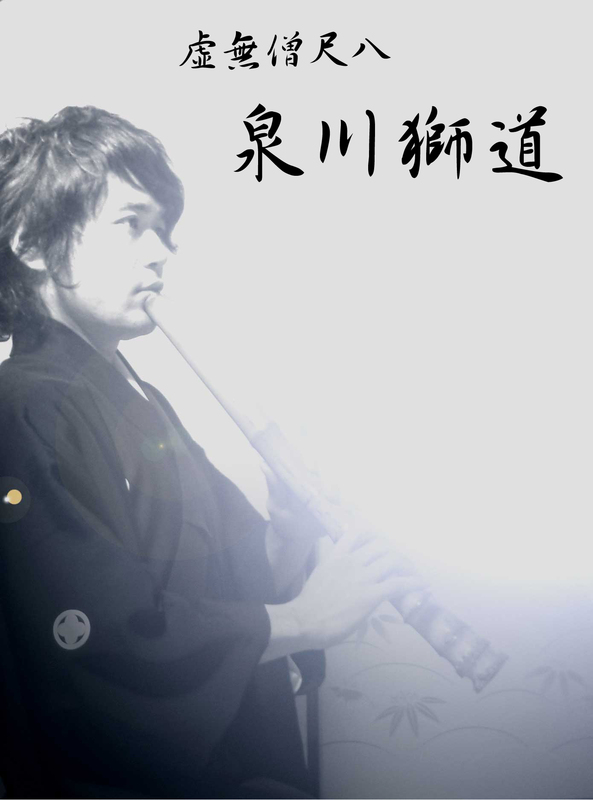 Izukawa seeks for the playing style of "Suizen," which is a way of Zen meditation for Myoan Taizan School shakuhachi, and the sound of Jinashi Shakuhachi called "Neaji (Taste of Sound)." In 2008, he formed a unit called "Kurofune" with an American shakuhachi player Josh Smith in whom he found to have "the power to deliver and express which firmly stems from his amount of practice." They promised to deliver the fascinating sound of Jinashi Shakuhachi and spread their music to the world. They have recently performed a fusion of shakuhachi and electro acoustic music at a pre-event for the "Nara Sentosai" and "Takefu International Music Festival," and performed in Asia-Pacific Economic Cooperation and their activities are often followed by the media. They have been active giving lectures in New York, and Paris, and performing at many museums and music festivals both in Japan and overseas. They released their first album "Kurofune" in May 2009, and it was highly reviewed in many places. He studies Myoan Taizan School shakuhachi under Simura Zenpo. He has taken professional western music education since he was a child, and he is versatile having been a member of a rock band to being a singer-song writer. He has established his own creative policy just as he sought for the unique spirit within Japanese traditional music. He has worked on sound producing which crosses genres. He has put his effort in the development of electro acoustic music, and he is attracted to "Acousmatic -Music." He took the first place in the CCMC Composition Contest in 2008, and he also won the ACSM116 Award and FUTURA Incentive Award at the same time. He won the best presentation award at the 81th meeting of IPSJ-SIGMUS. He joined the MOTUS (France) Composition Atelier 06. His pieces are sponsored in many international music festivals and performed in FUTURA (France), Silence (Italy), and aired on the FM radio RSF (France). He studied composition from UEHARA Kazuo, Acousmatic-Music from DUFOUR Denis. Copyright (C) 2016 Shido IZUKAWA, All rights Reserved.